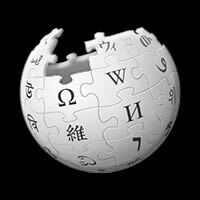 The Fields Of Athenry was written by Pete St. John in the 1970's. This version by Paddy Reilly is featured on the album of the same name. Level Of Ease: Easy. You will need to play 1 barre chord, C#m... it's a fairly easy one. If you haven't learned barre chords yet, try the alternative C#m chord (alt). I have included it especially for beginners, however you must avoid the 2 bottom strings - numbers 5 & 6 - the lowest sounding fat strings. It doesn't sound as full as the barre chord as you are not leading with the root note of C# as your bass note. However, it will get you out of trouble until you learn some barre chords. When reading the charts, take note of the fret numbers, as you often assume that all the charts are from frets 1 - 3, however C#m starts on the 4th fret, and finishes on the 6th fret. B7 is probably the hardest amongst the list of basic guitar chords, but persevere with it because with time it becomes a very easy and natural chord to play... it will become one of your favorites. 4/4 time - 4 quarter-note/crotchet beats per bar. The count is | 1 2 3 4 | or | 1& 2& 3& 4& | etc. 2 chords separated by a hyphen in a bar means the timing count of the bar is split evenly between the 2 chords, e.g., | E - A | means you play the E for 2 beats and the A chord for 2 beats (4/4 time). The song is very straight-forward. It is one of Ireland's favorites, and after playing it a few times, you'll know why. 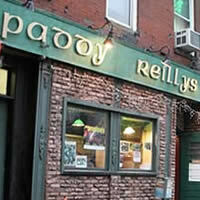 PADDY REILLY chords and lyrics are property and copyright of their owners. 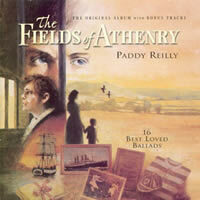 "The Fields Of Athenry" chords and lyrics are provided for educational purposes and personal use only.